Our Abpromise guarantee covers the use of ab36513 in the following tested applications. Required for checkpoint mediated cell cycle arrest in response to DNA damage within both the S phase and G2/M phases of the cell cycle. May serve as a scaffold for the recruitment of DNA repair and signal transduction proteins to discrete foci of DNA damage marked by 'Ser-139' phosphorylation of histone H2AFX. Also required for downstream events subsequent to the recruitment of these proteins. These include phosphorylation and activation of the ATM, CHEK1/CHK1 and CHEK2/CHK2/CDS1 kinases, and stabilization of TP53 and apoptosis. ATM and CHEK2 may also be activated independently by a parallel pathway mediated by TP53BP1. 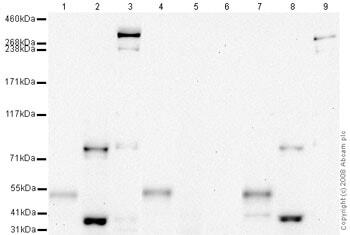 Tandemly repeated BRCT domains are characteristic of proteins involved in DNA damage signaling. In MDC1, these repeats are required for localization to chromatin which flanks sites of DNA damage marked by 'Ser-139' phosphorylation of H2AFX. Phosphorylated upon exposure to ionizing radiation (IR), ultraviolet radiation (UV), and hydroxyurea (HU). Phosphorylation in response to IR requires ATM, NBN, and possibly CHEK2. Also phosphorylated during the G2/M phase of the cell cycle and during activation of the mitotic spindle checkpoint. Nucleus. Associated with chromatin. Relocalizes to discrete nuclear foci following DNA damage, this requires 'Ser-139' phosphorylation of H2AFX. Colocalizes with APTX at sites of DNA double-strand breaks. ab36513 has not yet been referenced specifically in any publications. Publishing research using ab36513? Please let us know so that we can cite the reference in this datasheet. There are currently no Customer reviews or Questions for ab36513.